Disney Girl's Simba Lion King Shirt-Animal Kingdom Outfit-Timon Pumbaa Lion Outfit-Safari Tree of Life Animals Outfit Shorts or Capris. How absolutely cute is this new outfit. 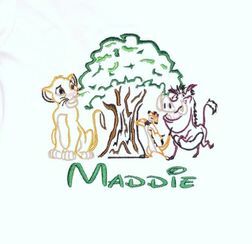 We start with a soft, white shirt and embroider it with Simba, the Tree of Life, Timon and Pumbaa in the bright colors of green, brown and red. The shirt is paired with sweet green gingham shorts or capris with ruffles and brown ric rac above. 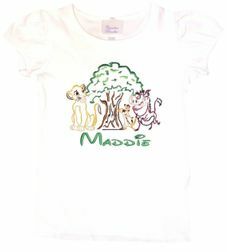 Your little one's name can be monogrammed under the scene in green Disney font.